Pumpkin soup – I love it! Sadly it no longer loves me. Hot liquids in general trigger indigestion for me these days, so I’ve given up hot teas and coffee, and now have them ‘iced’. A bowl of pumpkin soup is certain to result in quite bad indigestion, though I can eat pumpkin in non-soup form without a problem. However sometimes I throw caution to the wind and have some regardless, prepared to suffer the consequences. I’ve made quite a variety of pumpkin soups over the years, and my ‘standard’ recipe varies greatly. I rarely make a vegetable soup without adding in a legume of some description, just to increase the nutritional value. 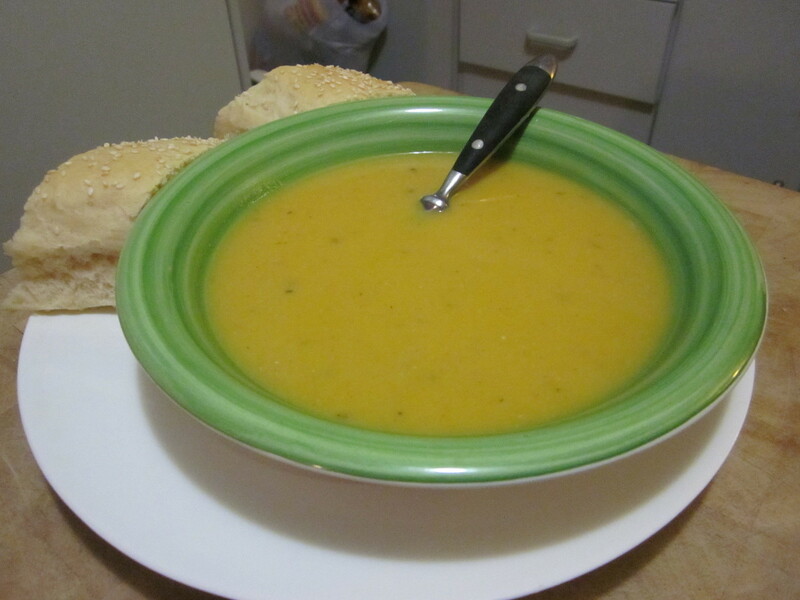 I try to make it something that’s the right colour, so pumpkin soup gets red lentils. The coconut cream or milk makes it nice and creamy, and adds a hint of coconut flavour – not too strong. At least I don’t find it too strong, you might prefer less. As it all gets blended at the end, I don’t worry about chopping things into small pieces. In a large pot heat some olive oil and then add the onion and garlic. Fry for a few minutes until the onion starts to brown. Then add the cumin, coriander and chilli and cook it for a minute or so. Add the carrots, pumpkin, lentils and stock, put on the lid and simmer until everything is well cooked. Once it’s cool enough blend it all together – I use a stick blender for this, then add the coconut cream (or milk) and pepper to taste. Enjoy a big bowl topped with fresh coriander or parsley if you have any and some lovely fresh bread or toast for a warming meal.